ItemBARK_1979.0058.0123.C - Hand tinted photograph of six women in Chinese silk dresses. Item BARK_1979.0058.0123.C - Hand tinted photograph of six women in Chinese silk dresses. 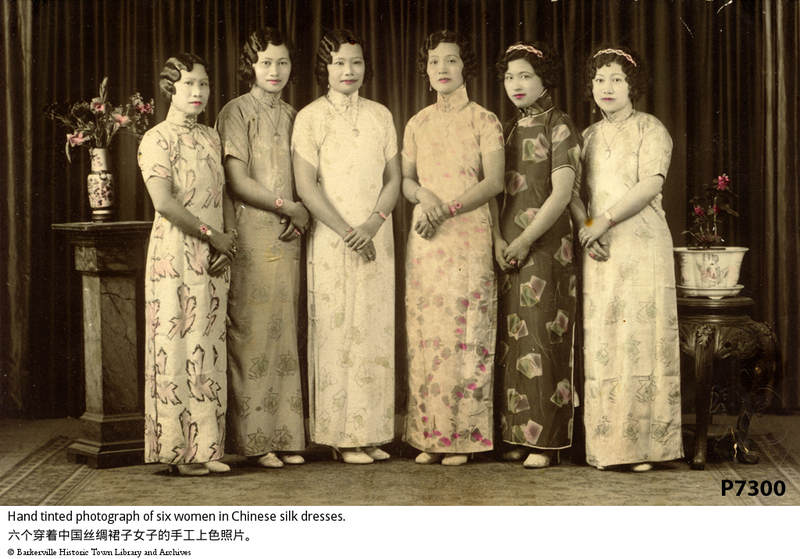 Six Chinese women dressed in long Chinese dresses. They are standing between a pedestal with a vase full of tined pink flowers and a small ornate table with a potted tinted flower. All the women have hand tinted red lips and three outfits are also tinted. Black and white. Dimensions: 13.7 cm x 8.7 cm. A visitor to the "Who Am I?" exhibit identified these women, Left to right, as: Yip Shee Wing, (Mrs?) Lee Chong, Lillian Lee Chong, Mrs. Keen, Unknown, Unknown.